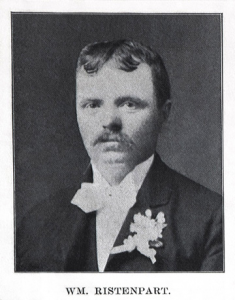 Husband of Hermine (nee Danne) Ristenpart, married March 25, 1894 in St. John’s UCC, Beecher, IL USA. The departed, William Ristenpart, entered upon the voyage of life on the vast expanse of the Atlantic Ocean, October 20,1863. After his parents had landed and settled on a farm near Beecher, they did unto him as Christ commanded and had him baptized in the name of the Tribune God. Through home training, faithful instruction in the word of God at home and in the church, he was prepared for the honor of confirmation, which took place April 14, 1878, at St. John’s Church, Rev. Keuchen performing the rites. On March 25, 1894, he was united in marriage to Hermine Danne, his now deeply sorrowing widow. The marriage ceremony took place in St. John’s Church, Rev. G. Koch officiating. This union, although not blessed with children, was always a happy partnership of two loyal, loving hearts. 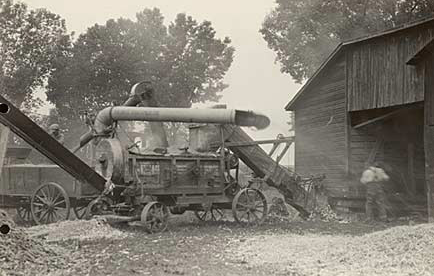 The young couple for the first fifteen years of married life, resided on the Danne homestead, 5 miles south-west of Beecher, Where the departed not only engaged in farming but also followed his natural inclination for machinery in operating a threshing and corn shelling outfit. 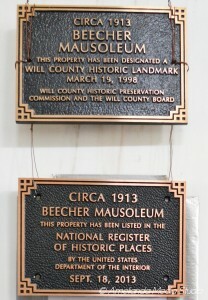 He continued in the two-fold occupation when about 25 years ago he made Beecher his definite home. Always robust in health, energetic in spirit and faithful in his work, his life abounded in the blessings and grace of God. Even after suffering a light paralytic stroke in 1927, from which he slowly but not completely recovered, he didn’t cease from his labors but carried on as faithfully as he could. Following a few weeks of visible failing strength, it was on Saturday, May 20, that another stroke forced him to seek his bed. 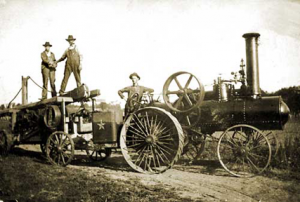 Given the best of medical attention and loving care on the part of the wife and his brother, Fred, it soon became apparent that he was nearing the end of his earthly sojourn. Without much suffering and hardly a struggle, he closed his eyes in death and peacefully came to rest on Thursday, May 25, at 5 p.m., at the age of 69 years, 5 months and 5 days. He leaves to mourn his departure, his wife; one brother, Fred; one sister, Mrs. Geo. Kappe; one brother-in-law; two sisters-in-law and a large host of other near and distant relatives and friends. Funeral services were conducted on Sunday, May 28, beginning at 1:30 p.m., at the residence and continued at St. Lucas Church, where Rev. 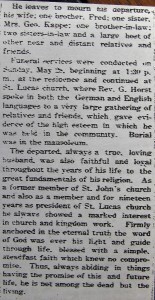 G. Horst spoke in both the German and English languages to a very large gathering of relatives and friends, which gave evidence of the high esteem in which he was held in the community. Burial was in the mausoleum. The departed, always a true, loving husband, was also faithful and loyal throughout the years of his life to the great fundamentals of his religion. As a former member of St. John’s Church and also as a member and for nineteen years as president of St. Luke’s Church, he always showed a marked interest in church and kingdom work. Firmly anchored in the eternal truth the word of God was ever his light and guide throughout life, blessed with a simple, steadfast faith which knew no compromise. Thus, always abiding in things having the promise of this and future life, he is not among the dead but the living. Other, more distant family include: Bahlman, Batterman, Bergmeier, Beseke, Bielfeldt, Bohl, Cloidt, Dunlap, Engleking, Fenske, Fick, Freerking, Frobose, Graham, Guritz, Hack, Hager, Haltenhof , Heine, Heldt, Hildeman, Hinze, Hoffman, Hoppensteadt, Horn, Hunte, Kaczynski, Kilborn, Kirchhoff, Klocksieben, Koch, Langreder, Leder, Maass, Matthias, Mc Carty, Meyer, Monk, Niedert, Ohlendorf, Pansa, Peters, Pralle, Riley, Rohe, Rust, Saller, Selk, Struve, Thielman, Vagt, Von Engeln, Wegert, Wehmhoefer, Wiechen, Westphal, Wilkening. 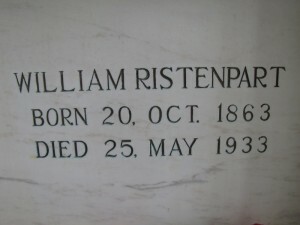 Amazing how similar William Ristenpart looks to my father Verdell Ristenpart. He would be my father’s great or great great uncle.